The Weekend Foodie: 4 Ingredients Organic Banana Cocao Nice Cream - 100% good for you! 4 Ingredients Organic Banana Cocao Nice Cream - 100% good for you! Sam and I have been going to way too many food events and being a little bit greedy when it comes to eating. We've been eating till we get stick. We both feel ridiculously bloated and agreed to stick to healthy eating outside of Instagram. As a part of September being Organic Awareness month (I honestly think every month should be organic awareness month!!! I try and buy organic whenever I can and whenever my wallet allows me), here's a recipe using all organic products. 1. Peel the bananas, chop them up and put it in an air tight container. Store the bananas in the freezer over night. 2. Mash up the bananas the next morning, I used my bare hands and a spoon (we don't have a blender anymore!!! ), if you have a blender, use it! (you will need to add a small amount of water or organic coconut water to get the blending going, if you are using a blender). 3. Once fully mashed, add a teaspoon of cacao powder (if you add more it might be a smidge bitter) and keep mashing/blending until fully mixed. 4. Add coconut flakes into the mix and lightly blend/mash for approximately 10 seconds. 5. If you are mashing the bananas with your hands, you might need to put the nice cream back into the freezer for an hour if you want a solid texture. Otherwise your nice cream is ready to serve, top your nice cream off with some organic apple crumble for that extra crunch. 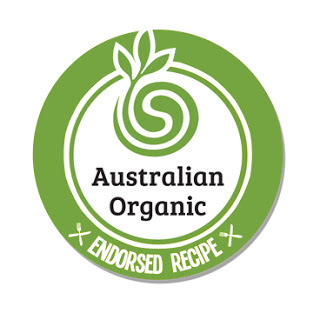 Thank you Australian Organic and Missy Mischief for supporting me.